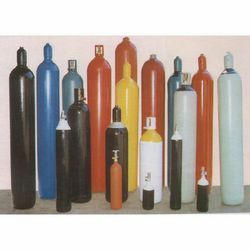 A wide range of High Pressure Industrial Gas Cylinders that is used for a range of purposes is acclaimed in the market for the high pressure supply that they offer. They are developed in international standards and meet all the norms to meet the satisfaction level of our clients. Cylinders for Compressed Industrial Gas viz. Oxygen, Nitrogen, Hydrogen, Argon, Air, Carbon Dioxide, Nitrous Oxide etc. These cylinders are made from fine quality raw materials under the guidance of our expertised professionals to provide our client with one of the best product with optimum quality. The apparatus offer client with the ultimate protection equipment from all hazardous gases and chemicals. These are offered at industry leading prices. Looking for High Pressure Industrial Gas Cylinders ?